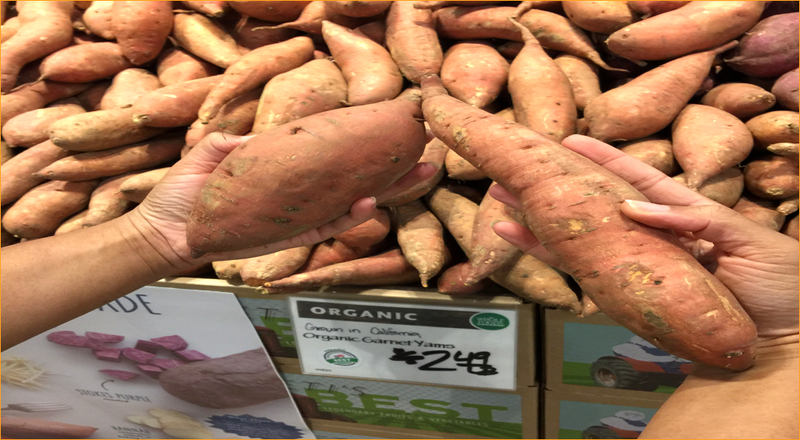 How to pick a proper sweet potato for your sweet potato pie? My granny is famous for her sweet potato pie. She comes from a generation where home cooking was the standard and she lived the Beyonce lyric “strong enough to bear the children, then get back to business.” This generation worked an 8 hour day, came home and cooked a Sunday meal full of fresh ingredients every day, did the household chores, cared for the children and still was able to “cater to their man” (all according to my granny). When I would chat with her about the stated ails of the modern woman, her response would quickly be, “Girl, its doesn’t take anytime to throw a meal together. “ Hmm, I thought, if she could do it back then and even now at the age of 81 (cooking and raising three of my cousins’ young children, all under the age of 11), I am sure that me, and other women like me, can do it, too. My granny and women like her are a testament to what is possible. They are proof that getting back to basics, making use of what you have, and putting your “foot in it” (a saying that simply translates to putting your love into your food) can take you far in life. So, when I had the opportunity to shadow my granny in the kitchen two Christmaes ago, I was blessed with a double portion of wisdom and family recipe secrets that I have been entrusted with to carry on. So many lessons came from this half day session of baking with Granny, but today I want to focus on one of the tips that she shared when baking her sweet potato pie. Now, you must understand in our family when the season of fall comes around, our pie of choice is not pumpkin – it is sweet potato. This is not a pie that can be simply purchased from the store (although I see Pattie Labelle is hitting high notes with her current commercially available pie). Up until now, it is very rare that you would find a sweet potato pie lining the aisles of your market bakery. No, this pie is something to be made at home – preferably by the hands of an elder (their hands are seasoned and somehow make that thing taste right). In more recent years, our immediate family has lovingly named my granny’s pie “who put pork in my pie,” because of her secret ingredient – a vanilla gelatin pudding. Please don’t be mistaken – this pie taste nothing like pork. It is smooth and creamy with notes of allspice, nutmeg, and vanilla. The sweet potato, unlike the pumpkin, has a deeper and richer flavor when it comes to the pie. Although both the pumpkin pie and the sweet potato pie have a smooth feel, the sweet potato pie has more of a bite to it and doesn’t smooth out and dissolve like the pumpkin. It requires a bit more chewing, which I like, because you get to swirl the smooth texture of the pie around your mouth with your tongue getting even more of a chance to taste the layers of the flavor. Her pie’s overly darkened edges somehow also add a depth of flavor that makes you hope that she always remembers to cook it just a bit over – so not to take away anything your taste buds are expecting. However, the pudding is not the only secret. The proof my be in the pudding, but its also in how you select your ingredients. As a health coach, one of my missions is to get people reacquainted to “real food” again – for people to get back to the basics and in touch with the foods that they are feeding themselves and their families. That afternoon in the kitchen was a re-introduction to this amazingly healthy beneficial root vegetable – the sweet potato. Having studied nutrition, I have learned that when it comes to a loaded potato, the sweet potato definitely is packed. It is loaded with antioxidants, Vitamin A, and Vitamin C. As a matter of fact, it has four times the recommended daily allowance of beta-carotene (which the body can convert to Vitamin A) and 42% of the recommended dose of Vitamin C. Vitamin A and C are both anti-inflammatories, which makes sweet potatoes a perfect choice for those who deal with ailments like asthma and arthritis. We all should celebrate the sweet potato, because this is a complex carb that our bodies love. In fact, according to nutritionist at the Center for Science in the Public Interest (CSPI), the sweet potato is ranked number one in nutrition out of all vegetables. Wow – if that doesn’t make you substitute your pumpkin pie for sweet potato pie, I don’t know what will. But are all sweet potatoes created equally? Well, when it comes to preparing pie, there are definite characteristics to use to select the right sweet spud. First, always select organic. During my granny’s time, this wasn’t so much of a concern, because most produce was organic, but today we must make sure that we select what’s most healthful for us – and that is organic. Secondly, choose the tuber with the orange flesh. Some grocery stores may call it a yam. In fact, in our home that is exactly what we call it, although it is technically a sweet potato. Third, make sure that your sweet potato meets the criteria that Merle Travis set in his song “So Round, So Firm, So Fully Packed.” Yes, I do enjoy a good country tune. If it does have a thin tip at the end, do not despair. Simply remove the tip, so as to prevent the feeling that you have stringy hair in your pie. Whatever you do, do not, I repeat, do not select the “heroin chic” runway version of this vegetable, it will only leave your pie strung out. And no one wants strings in their pie.